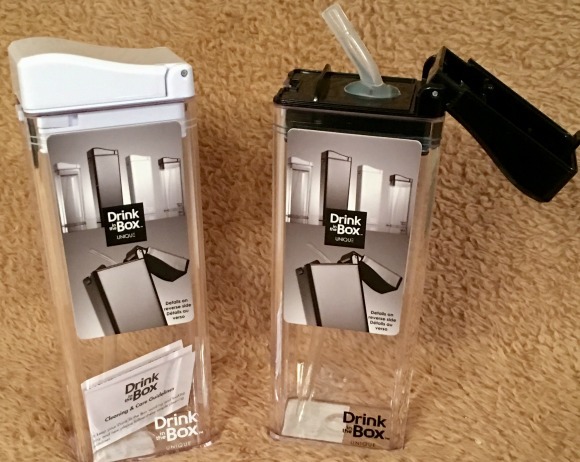 Stacy Tilton Reviews: Drink in a box...say what? Drink in a box...say what? Have you ever had your water bottle tipped over on your desk because the bottom isn't flat and stable? I know I have knocked mine over more than a few times myself. Many times plastic water bottles have a slightly rounded bottom making them not so perfect when it comes to sitting them on a flat surface. Yeah they are great on the go and fit your car cup holder perfectly, but if you're like me you also want to be able to use it at home perfectly too. I honestly thought there wasn't a solution...that was until I was introduced to the Drink in the Box UNIQUE. It's a slim and sleek fashionable reusable drink box, perfect for workouts, carrying in your bag, or sitting safely beside your computer keyboard. WOW now why didn't anyone think of this before? I mean it's really a no-brainer to have a flat bottomed container that won't easily tip over. I've been using mine for a few weeks now at my desk and am loving that it doesn't tip over so easy if I accidentally bump into it when reaching for something on my desk like my old water bottle did. I also like that I can see how much liquid is inside without taking the top off since I got my samples in clear. I will make a few side notes just for reference if you do purchase one though. First off there is a small faint line on the box that is the "max fill line". Do not fill past this or you may end up wearing your beverage when you put the lid on. Also make sure you put the lid on while it it flipped open with the straw visible. This keeps air from getting inside the straw that may cause it to leak out when being opened. (Yes I've experienced this myself.) Other than that I have been quite happy with our drink boxes! •Offers a one-handed, snap lid with straw design that will stand up to the test of active, busy lifestyles. 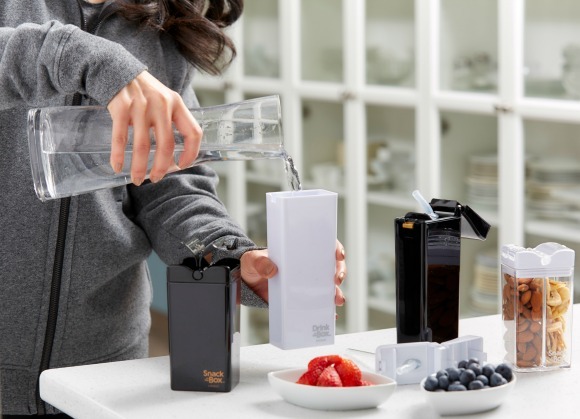 Simply press the button to open and sip, and then close it when finished. • Food-safe silicone straw is replaceable and detaches from the top for easy cleaning. •TritanTM body is dishwasher safe (top-rack please!) so no need to worry about mold or bacteria. • Available in four sophisticated colors- Black, White, Clear/White and Clear/Black. If that is sitting on your desk nobody will suspect that it is water. Kudos to design innovation! I would love it to be insulated as well.